This site has pictures and instructions of all the best tummy exercises that work your stomach muscles. This page shows you a challenging exercise on a bosu ball that can help to tone your tummy and strengthen your stomach muscles. The bosu ball challenges your muscles a little more than the floor because it is unstable. 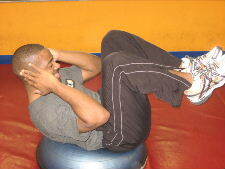 You also get more range of motion because of the contour of the bosu ball. This is a really challenging stomach exercise, and just balancing on the bosu ball is very hard work for the stomach muscles. Don't get frustrated if you can't do more than 5 at a time, just keep practicing and build up your strength and coordination. Form: Exhale and crunch your upper body up towards your knees. Hold for a brief second and then slowly lower to the starting position. 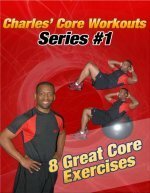 Personal Trainer Tips: The initial positioning is the key to this exercise. If your hips are too far off the ball you will tip towards your feet, and if your hips are too far on the ball your body will tip towards your head. In the beginning try to perform 5-10 reps, and as you get stronger aim for 10-25 repetitions per set. If you master this stomach exercise and want a greater challenge try oblique crunches on a bosu ball with the feet up or bicycle crunches on the bosu ball with the feet up. But remember that tummy exercises and tummy toning exercises are only a part of getting a smaller waist and trimming down your tummy.